My beautiful car TUZ442 has gone. Over the past few years I have been unable to hear the clutch and had to replace the clutch about a year ago. I'm going to go for something smaller and automatic. Probably a Toyota Yaris or similar. I had my green Subaru for about 9 years. 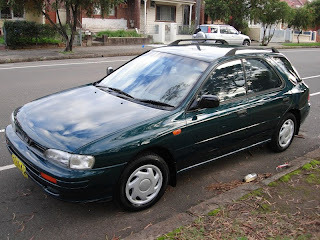 It was the best car to drive in the wet and was great to/from Byron and around town too. Goodbye - enjoy your new life, hopefully rust-free.